Easington Sports boast a 100 per cent record in the UHLSport Hellenic League. Goals in either half from Henry Rose and Joe Eyre and another clean sheet helped to maintain Sports perfect start with a 2-0 victory at Almondsbury in Saturday’s Division One West clash. The first half was an even affair although the dismissal of Neil Bailey on the half-hour mark swung the game in the visitors’ favour. Moments later Rose got the benefit of a kind bounce and broke through one-on-one with the keeper and finished comfortably to give Sports the lead. Adam Rimmer had to be alert to make one good save but was otherwise quiet in the first half playing behind a well organised defence. 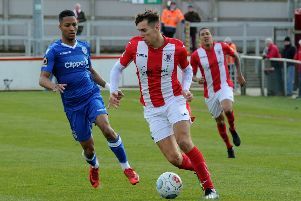 Lloyd Sabin has settled in well at the back alongside Josh Rose and Dan Watkin while Charlie Hill impressed in midfield after returning from suspension, shortening up the passing, linking defence and attack. Sports continued to be the superior side in the second half and the extra man made a difference as the half wore on. The crucial second goal game early in the second half when Hill played a perfectly weighted pass for Eyre to bag his fifth goal of the season. Manager Ben Milner gave all the travelling squad much needed minutes and Sports continued to create a number of half chances without drawing the home keeper into anything other than routine saves. But another clean sheet was a pleasing aspect of their performance and capped a perfect start to the season so far.